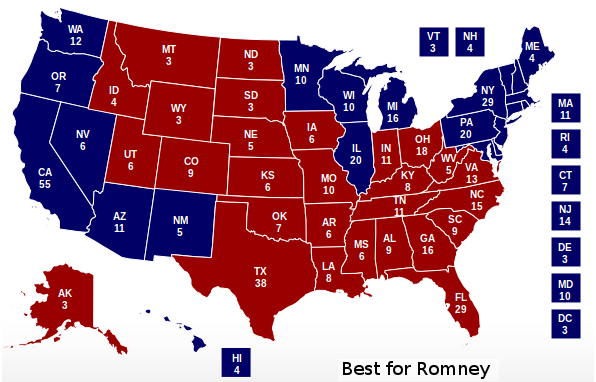 Best for Romney: in each state the preference of c=2 people among the n polled is changed from Obama to Romney. In practice, we are assuming that two voters in each State lied during the poll (or changed their mind) and we test how this affects the prediction of the election result. 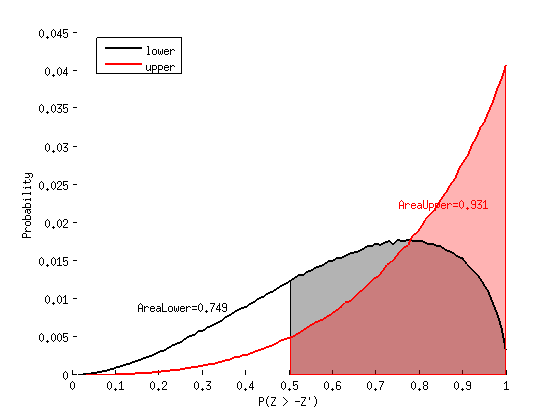 These two cases are naturally obtained by applying a Bayesian approach in which prior ignorance is modelled through a set of near-ignorance prior probabilities. Under this view, changing the preference of the 2 voters is equivalent to test the robustnees of the inferences to the choice of the prior model. 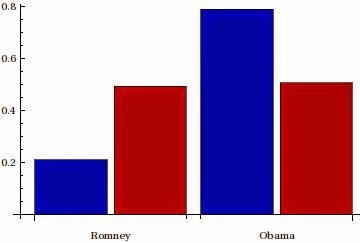 The probability of winning of the two candidates is shown in the following bar-plot, where the blue-bar refers to the "Best for Obama" case and the red-bar to the "Best for Romney" case. In the "best for Obama" case, the probability of winning of Obama is 80% and, thus, the probability in favour of Romney is just 20% (the blue bars). Conversely, in the "best for Romney" scenario, the two candidates have equal probability of winning, stated differently we can say that the odds are 50-50 (the red bars). This shows that the prediction of the election result, 2 weeks before the election, is highly uncertainty. 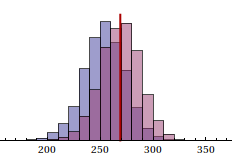 The probability distribution of the electoral votes in the two extreme cases is shown in the following histogram. (case 1 light red histogram, case 2 light blue histogram) together with the 50-50 line (equal to 269 electoral votes). It can be noted that the light red histogram is almost symmetric with respect to the 50-50 line, which means that in the "Best for Romney" case the two candidates have equal chance of winning. From the histogram, it can be noticed that there is a high uncertainty. Because of this uncertainty the contribution of the prior on the final result is crucial. In fact, notice that it is enough that in each state the votes of two electors among the n sampled change (they represent less than 0.4% of the total number of the polled voters) from Obama to Romney, that Romney's chance of winning reaches 50%. The electoral maps of the two cases are reported hereafter for the "Best for Romney" and, respectively, "Best for Obama" case. The maps show that, based on the polled data, the critical States are Ohio and Iowa. If Romney wins in these two states, his chance of winning goes from 20% to 50%. 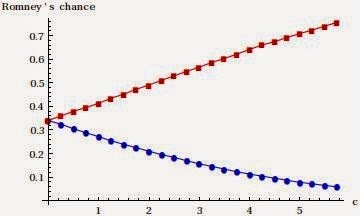 The following plot shows the dependence of the probability of the two cases as a function of the parameter c, i.e., the number of votes that moves from Romney to Obama (blue line) or vice versa (red line). It can be noticed that the red line crosses 0.5 at c=2. Thus, this shows that 2 is effectively the critical value for the swing scenario.